The sun rises, the sun sets, and Norway wins the women’s 4 x 5-kilometer relay in Ulricehamn, Norway on Sunday. For the 11th time in a row, a Norwegian women’s team bested the world in the storied race format. Heidi Weng, Therese Johaug, Astrid Uhrenholdt Jacobsen, and Ingvild Flugstad Østberg won in a time of 57:06.3 minutes. For the first tag, nine teams came in separated by 8.1 seconds. Johaug, skiing the second leg for Norway, opened a gap of 9.3 seconds over Russia I by the 10 k mark. The time back to second-placed Sweden I stretched to 37.4 seconds by the finish. Sweden I’s team consisted of Evelina Settlin, Ebba Andersson, Charlotte Kalla, and Jonna Sundling. Finland I placed third (+41.2) wth Laura Mononen, Krista Pärmäkoski, , Riitta-Liisa Roponen, and Evelina Piippo. 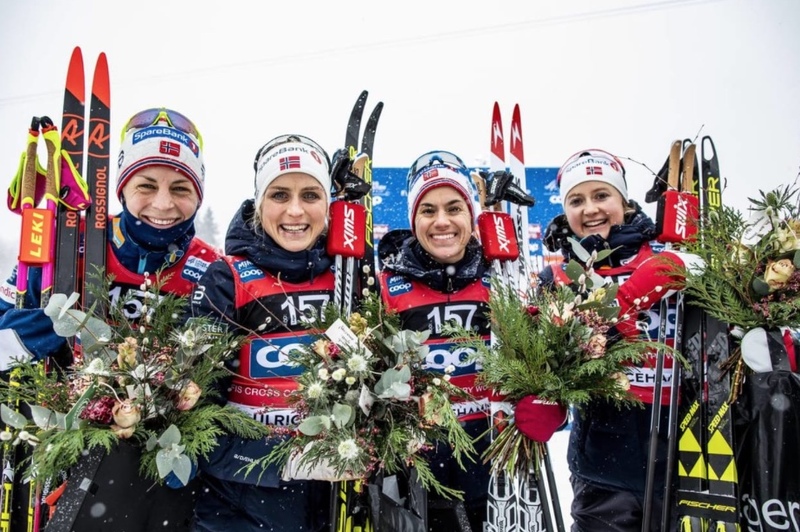 The U.S. team of Sadie Bjornsen, Rosie Brennan, Caitlin Patterson, and Jessie Diggins finished in sixth (+1:26.6). In the men’s 4x 7.5k relay, Russia II and Russia I came away in first and second place respectively. Russia II’s team of Evgeniy Belov, Alexander Bessmertnykh, Denis Spitsov, and Artem Maltsev won in a time of 1:17.53.2 hours. Russia I’s Andrey Larkov, Alexander Bolshunov, Andrey Melnichenko, and Sergey Ustiugov finished 20.8 seconds back. In third was Norway, 35.8 seconds behind. Hans Christer Holund, Didrik Tønseth, Sjur Røthe, and Simen Hegstad Krüger, Norway’s foursome, were 35.8 seconds back. On the first leg, at 9.7 k, Norway was in ninth place, with a 43.1-second deficit. The U.S. team of Erik Bjornsen, Scott Patterson, David Norris, and Ben Lustgarten placed 13th (+4:10.8). On Sunday in Antholz, home country athlete Germany’s Laura Dahlmeier won in 35:32.8 minutes while skiing a single penalty lap during her first prone stage. The Czech Republic’s Marketa Davidova placed second (13.1, 0+0+1+0), with Vanessa Hinz of Germany in third (+16.4 1+0+0+0). US Biathlon’s Clare Egan raced and shot to 15th overall, 1:05.8 back, with two penalties in her first prone stage, otherwise she shot clean. Rosanna Crawford of Canada placed 28th (+3:50.2, 0+1+3+1). In the men’s 15 k mass start, there was one new development: Johannes Thingnes Bø of Norway did not win. He did, however, place second to France’s Quentin Fillon Maillet. He won the race in 34:39.4 seconds while shooting clean in all four stages. Bø was 14.3 seconds back in second place, with a single miss in each of his standing stages. Germany’s Arnd Peiffer was third (+24.6, 0+0+0+0). Christian Gow of Canada was the sole North American in the race. He placed 27th (+3:22.5, 1+1+0+1). Kaitlynn Miller (CGRP) won the women’s 1o k classic mass start in 36:12.7 minutes. Coming in 2.9 seconds back was Jessica Yeaton (APU/Australian National Team) in second place. In third, skiing for Dartmouth, was Katharine Ogden (37:27.8). Kyle Bratrud (SMS T2) won the men’s 15 k classic mass start in 46:41.3 minutes. In second place was Adam Martin (CGRP) who raced to a time of 46:55.0. Canada’s Andy Shields (Lappe Nordic) placed third in 47:41.6.